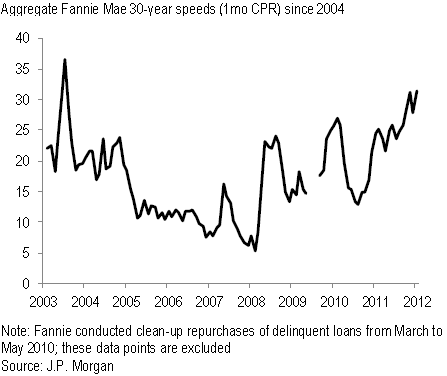 US mortgage prepayment speeds have accelerated to the highest level since 2004 recently. Most assume that this is all coming from recent mortgages with low loan-to-value ratios. As rates decline, those who took out a mortgage in 2010 for example are now refinancing it. But there is a bit more to the story. If one looks for example at the 5%, 30-year FNMA pool (these are loans paying roughly 5.5% interest on average), a different picture emerges. The pre-2009 "vintage" mortgage prepayment speed for these high coupon mortgages is higher. 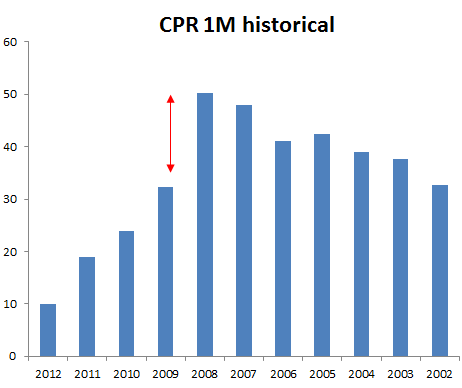 The chart below shows CPR (prepayment rate) by mortgage origination year. 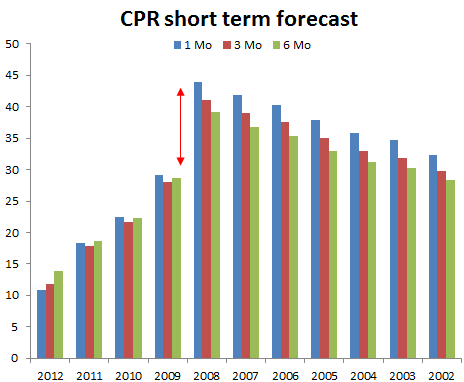 The short-term prepayment forecast from Credit Suisse looks similar. It means that the older mortgages with homes that are more likely to be "under water" are actually refinancing faster. The current loan-to-value (LTV) ratio must be greater than 80% ["under water" mortgage ineligible for standard financing]. So that's how 2009 cutoff comes into the picture. Those who took out a 5.5% mortgage (for example) after 2009 and could refinance, already did - that's why the refi speed after 2009 for these mortgages is lower. But those in the pre-2009 bucket are refinancing via HARP. According to JPMorgan, under the second HARP program, a million borrowers have refinanced their mortgages in 10 months. The program is expected to be in place until the end of 2013. The combination of HARP and the Fed's MBS purchases keeping rates low, mortgage refinancing is expected to stay elevated next year. 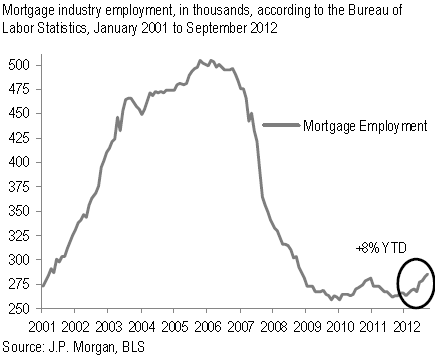 And of course mortgage originators should do quite well in this environment. In fact banks are boosting staff levels to deal with the refi wave. JPMorgan: - Sustained by HARP 2.0, and then QE3, [the refi wave] is poised to last well into 2013 and eclipse the prior record in duration, though not in magnitude. Extended periods of low rates compel originators to expand mortgage banking capacity to take advantage of the business opportunities.